This name uses Spanish naming customs: the first or paternal family name is Butragueño and the second or maternal family name is Santos. Emilio Butragueño Santos (Spanish pronunciation: [eˈmiljo βutɾaˈɣeɲo ˈsantos]; born 22 July 1963) is a Spanish retired footballer who played as a striker. He was best known for his spell with Real Madrid. Nicknamed El Buitre (The Vulture), he was a member of the legendary Quinta del Buitre, along with Manolo Sanchís, Rafael Martín Vázquez, Míchel and Miguel Pardeza. Butragueño amassed La Liga totals of 341 games and 123 goals for his main club, in 12 seasons, and represented the Spain national team in two World Cups (being the second top scorer in the 1986 edition) and as many European Championships, scoring 26 goals for his country in a record that stood several years. In 1981, he joined the Real Madrid youth system, playing first for its reserve side before being given his senior debut by Alfredo Di Stéfano on 5 February 1984 against Cádiz CF: he made an instant impact, scoring twice and assisting for the third goal in a 3–2 away turnaround, after Real trailed by 0–2. On 12 December that year he made his European competition debut, contributing with a hat-trick to a 6–1 home triumph against R.S.C. Anderlecht for the UEFA Cup third round (after a 0–3 loss in Brussels), as the Merengues went on to win the competition. At the time, Real Madrid's form was so patchy the first team's attendances were smaller than those of the reserve side. Butragueño contributed to the side's transformation, and was a prominent member of the team during the 1980s, winning numerous honours: he received the European Bronze award for best footballer in two consecutive years, and won the Pichichi Trophy in 1991, while also being instrumental in the capital club's five La Liga trophies, two Copa del Rey and two consecutive UEFA Cups. In June 1995, having lost his place in the Real Madrid side (only eight games and one goal, as the club won another league), mainly due to the emergence of 17-year-old Raúl, Butragueño signed for Club Celaya in Mexico and, in his first year, the team reached the final of the national championship. After three seasons where he was known as the Gentleman of the Pitch – never received a single red card during his entire career – he finally decided to retire from the game in April 1998. Butragueño earned 69 caps for Spain, and scored 26 goals. His debut came on 17 October 1984 against Wales in a 1986 FIFA World Cup qualifier, although he had already been picked as an uncapped player for the UEFA Euro 1984 team as the nation finished runners-up. Butragueño was also selected for the 1986 World Cup, where he played a major part, scoring four goals as Spain beat Denmark 5–1 in the round-of-16 match. He also took part in the 1990 edition in Italy (four games, no goals). Still as a player, Butragueño had a computer game with his name released in 1988, for the Amstrad CPC, Commodore 64, ZX Spectrum and MSX. On 19 October 2004 he replaced Jorge Valdano, a former Real Madrid teammate, as the club's director of football and, until the end of the 2005–06 season, also served as the club's vice-president. Subsequently, he acted as head of Public relations for the organization. ^ "5–1: ¡Buitre, que grande eres!" [5–1: Vulture, you're so great!] (in Spanish). Mundo Deportivo. 19 June 1986. Retrieved 2 June 2014. 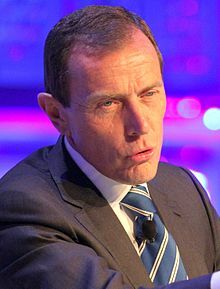 ^ "Emilio Butragueño". Footballdatabase. Retrieved 7 May 2015. Wikimedia Commons has media related to Emilio Butragueño. This page was last edited on 25 February 2019, at 02:58 (UTC).